Vaccines are a major weapon in the fight against disease. Today the Bill & Melinda Gates have pledged funds for a “decade of vaccines” in poor and developing countries. A video of the full press conference is available to the right of the press release page. 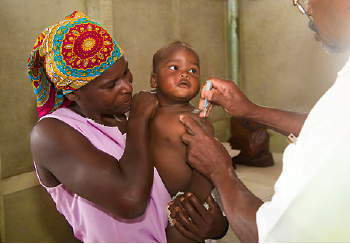 The broader announcement called for a wide range of initiatives including scaling vaccine programs up, laboratory research and clinical trials to create new vaccines, introducing new vaccines for pneumonia and severe diarrhoea among other things, and improving the market and access of vaccines in developing countries. The press release focuses on deaths, but it is easy to think that there will be wider benefits. I personally would want for more emphasis, over and above deaths, on reducing disease (with deaths or not) as much as that is harder to “sell” in the mainstream media. Any parent will know the burden of looking after sick children. In a setting of poverty, it must weigh down their already difficult lives. Likewise, these illnesses must divert limited hospital resources. They cite as an example of the value of increased vaccine programs a very recent account in New England Journal of Medicine reporting the effectiveness of the rotavirus trials in South Africa and Malawi, where efficacies of 76.9% and 49.4%, respectively, were observed. As this vaccine confers some “herd” protection, it would be expected to show higher efficacies in a nation-wide program compared to a trial. (So-called herd immunity is where mass vaccination protects a minority without the vaccine or for whom the vaccine did not “take”.) This report briefly looks at a lot of issues, such as the impact on children with AIDS.